Customers are able to get assistance before and after hours by calling the Police Department Number (325) 365-2121. They will contact the on call personnel. Exception: Some accounts require a deposit based on a one month usage and billing amount. * If customer has more than one service connection, a deposit is required for each service connection. Refunds of deposits shall be made upon the termination of service only after payment of all indebtedness. Application of the deposit may be made in partial or total settlement of accounts when service is disconnected for nonpayment of the bill. These are the current rates, subject to change by City Council. Meters are read around the 15th of each month. The period of service is noted your bill, along with the usage. All bills are due the 5th of the month; however, if the 5th falls on a weekend or legal holiday, by close of business the first day following. Billing is done so bills are mailed the 22nd day of the month. A 10% penalty will be added on the 6th when not paid by closing of business the 5th. Disconnect Notices are sent about the 6th of the month. 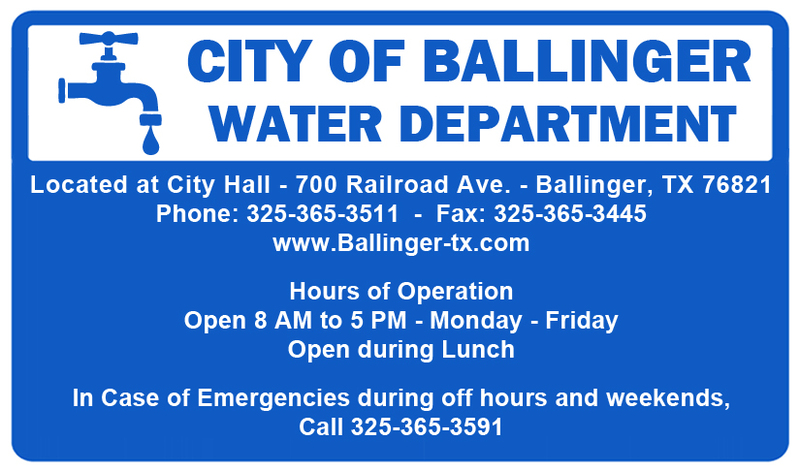 Water service will be disconnected (cutoff) if payment is not received by close of business the 14th of the month. In the event bills for services are not paid by close of business the 14th of the month (or the first business day following should the 14th fall on the weekend or a legal holiday), service will be disconnected (cutoff). The customer will need to pay a $40.00 service charge plus the past due bill in full to get service reconnected. Customers are NOT to reconnect the water service themselves. If a customer is found to be doing this without paying the bill, a lock will be placed on the meter. Once the meter has been locked, an additional $40.00 service fee will be added to the bill. Visitors to our City Park and City Pool say they are among the nicest and prettiest in Texas. Visitors year round have access to overnight camp sites. Camper hookups are available for $15.00 per night, check-out at 12:00 noon. These are available in two areas of the park. The City Pool is open during the summer months, staffed by certified lifeguards. There is an area for toddlers, fenced off from the main pool. The main pool has two diving boards on the deep end. Temporary Disconnection of Service $15.00. Reconnection of Service – If water is disconnected for Nonpayment of a bill, then the reconnection fee is $40.00 during business office hours and $50.00 if reconnected after hours. Charge for broken Cutoff in meter box $100.00 (if customer is responsible.